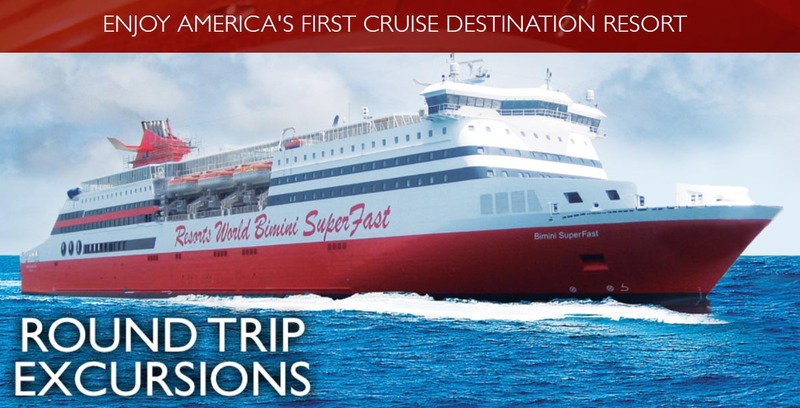 Browse: Home > Resorts World SuperFast Cruise Ship to Bimini is here! Resorts World SuperFast Cruise Ship to Bimini is here! Tired of being in Florida? Want a cool get away? You can now book a fast high-speed ferry to Bimini! The non-stop high-speed ferry to Bimini is a big game changer for the Island! Here’s more information on the high speed ferry to Bimini, Bahamas. New to the high-speed ferry scene, is the Resorts World SuperFast Cruise Ship! You board in Miami on the Bimini SuperFast, a ship built in Germany. With speeds up to 30 knots, she is the fastest cruise ship in America. At 32,000 gross tons, she will comfortably cross the powerful Gulf Stream separating Florida and the Bimini Islands Bahamas, twice a day. With World-Class Service from our international crew, you will have a memorable experience in our restaurants, bars and other facilities on the ship. The Miami Casino & Resorts World Casino- Whether you’re playing out at sea or ashore, you’ll experience world-class casino gaming with live action table gaming, the hottest slot machines and a sports book to bet on all your favorite teams! 6 restaurants and bars, like Ponce De Leon Restaurant, Aqua Bar & Grill, Bimini Breeze Café, Club Bimini and more!